Although the official start date of the project was April 1, 2006 the contract was not finally signed until September 2006. As a result, the kick-off meeting was delayed until November, largely due to unavailability of key staff members before then. The meeting was held on November 6 and 7, at the Park Village Hotel and Resort just outside Kathmandu, and was preceded by a visit to some of the ricebean growing areas in the south of the country. The tour included a visit to the LI-BIRD head office in Pokhara, where the participants were briefed by Dr PK Shrestha and met local staff. A visit was then made to the Gulmi field site where we met villagers and members of the local "Multi-purpose farmers’ group" and saw the germplasm assessment trial. Dr Shrestha gave an introduction to the village, which has cooperated with LI-BIRD for some time. From the discussions, it was clear that although farmers wanted a ricebean with high yield, a long duration and indeterminate growth habit were possibly more important in terms of food security. The maximum production of ricebean was 200 kg per household, of which 90% was consumed at home. The groups were shown samples of the harvested seeds and foliage, as well as the trial areas where a large number of ricebean accessions were being grown. These included both determinate and indeterminate types. Some had been harvested, others were still green. 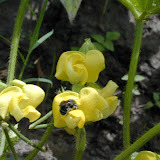 There was enormous diversity of phenotypes, with large, medium and small pods, striped and un-striped pods, and many variations in seed size and colour. One accession was estimated to have around 400 pods on it – these were large, and obviously this had high yield potential. It was indeterminate, and probably would be ready for harvest to begin by about the middle of December. After the field visit the participants returned to Kathmandu. The kick-off meeting was attended by representatives of all the partners. A number of areas were discussed, including technical, financial and administrative aspects. In particular, protocols were discussed for germplasm exchange and the participatory evaluation of the material. The meeting minutes will be available here for project members only.